There are several Maine camps equipped to serve campers who face physical, emotional, or intellectual challenges. Not all Maine camps are equipped to serve campers who face physical, emotional, or intellectual challenges. But for campers at facilities offering such services, the experience can be transformative. Among the best-known such camps is Pine Tree Camp, on North Pond in Rome, operated by the Pine Tree Society. The camp was founded in 1945 and offers full traditional camp opportunities in a barrier-free setting. Overnight and day camp offerings throughout summer reach children and adults alike. Special programming also takes place during the off-season. Also serving children and adults with disabilities is Camp CaPella, located in Dedham and founded in 1960. The camp on Phillips Lake promotes the philosophy that the environment maximizes “abilities and willingness for participation, and is appropriate to foster [campers’] self-awareness, growth, and development.” Camp CaPella Director Heidi Riggs said the eight one-week sessions host approximately 25 campers, about half staying overnight. The fully accessible property enables participants to enjoy swimming, boating, fishing and other traditional activities. “We give them that experience that those of us who live in Maine take for granted,” Riggs said. Weeks are divided according to age groups. “But within that week, we don’t break down by disability. They may be in wheelchairs or braces; none of that matters.” The camp relies significantly on donations, she said. “We don’t turn anyone away based on ability to pay.” The staff – one counselor for every two campers – includes college students pursuing education careers, including special ed. Other staff “come back year after year,” and work in local schools during the off-season. Clinical guidance is offered by nationally known psychiatrist and pediatrician Matthew Siegel, who has done extensive work in autism and child development. Professional staff also includes two speech language pathologists. Chaleff said that while about 50 percent of campers are from Maine, the 2018 list included campers from several other states. Her conversations with prospective 2019 families include one from Switzerland, she said. The camp experience creates self-confidence – “a change in perception of self,” Chaleff said. Staff also work to address camper anxiety, a significant comorbid issue with autism. “They all have anxiety because they don’t understand the world around them. Being with other kids like them alleviates anxiety immediately.” Each session hosts about 35 campers. Coaches are frequently graduate students studying speech pathology or occupational therapy, Chaleff said. Parents’ response to their kids’ experiences has been “awesome,” she said. Kids facing challenges may also find that they fit in at more traditional camps. Mike Douglass, director of Camp Bishopswood in Hope, said the camp is particularly appealing because of its lower cost. Douglass said if he knows ahead of time of a child’s particular challenges, he will discuss with the family whether the camp can meet that youngster’s needs. And for kids Douglass thinks will succeed, “I think they have a great time. 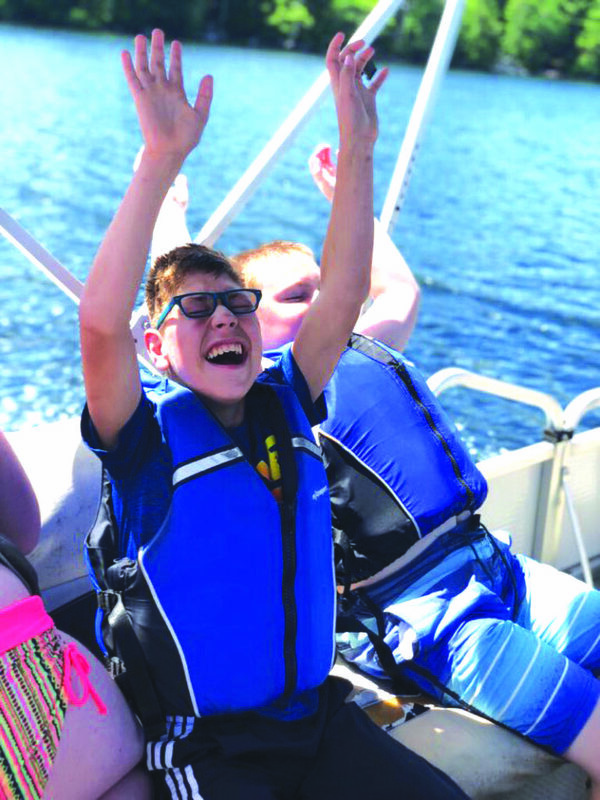 They come to camp and it allows them to be a kid.” Douglass said that as more youngsters are identified as being on the autism spectrum, he has looked closely at how Camp Bishopswood’s program can meet needs. That includes creating a “chill out zone” on the back porch of a camp building. “A lot of times camp is so intense, and there’s so much going on, they need that regrouping time,” Douglass said. In Brooks, Camp Forest offers both overnight expeditions and day programming, all designed to teach wilderness living skills. The camp is operated by the nonprofit Expanding Opportunities, based in Belfast. The organization’s Assistant Director, Catherine Sanders, said Camp Forest recently offered about six weeks of summer camp: Two weeks were overnight expedition programs, the other four day camp. The 2019 schedule is expanded, and includes a watershed expedition (overnight or day option); a “hills to sea” expedition (overnight or day); and a range of day offerings. About a quarter of campers faced behavioral challenges, Sanders said. The abundant one-on-one interaction is helpful for kids with behavioral issues such as social anxiety and ADHD.